The Sky City Cultural Center and Haakú Museum serves as the gateway to “Sky City” the Pueblo of Acoma, 60 miles west of Albuquerque, New Mexico. The New Mexico locale is North America’s oldest continuously inhabited settlement and a site of the National trust for Historic Preservation. The Sky City Cultural Center is a 40,000 square foot visitor and cultural center that strives to preserve and support the culture of the Acoma people. In addition to the museum exhibits, the cultural center sells Acoma pottery and crafts by local artisans in support of the community. The cultural center sits at over 6,000 feet above sea level, surrounded by desert rock formations, and big sky. The Haakú museum, located inside the cultural center, is home to the art, artifacts and history of the Acoma people. The museum’s focus is on preserving and revitalizing the cultural heritage of the Acoma. Beyond the visitor center is the Acoma Pueblo. The centuries old village has been built on top of a sandstone mesa, over 350 feet above the desert valley. The San Esteban del Rey Catholic Mission was built on the grounds in the 1600’s by the Acoma people. The adobe mission complex spans over 20,000 square feet. Both the mission and the pueblo are listed on the National Register of Historic Monuments, and are the only Native American sites to be honored as such. While most residents don’t live in the ancient city full time, many return for traditional events and ceremonies throughout the year. Artisans in the village continue to make traditional Acoma pottery, known for its thin walls, fluted rims, and geometric painted designs. The facility offers several meeting spaces that may be rented for presentations or events, as well as the Y’aak’a Café. In the Acoma language, Y’aak’a means ‘corn.’ The café’s menu offers a variety of contemporary American fare combined with traditional Acoma dishes. 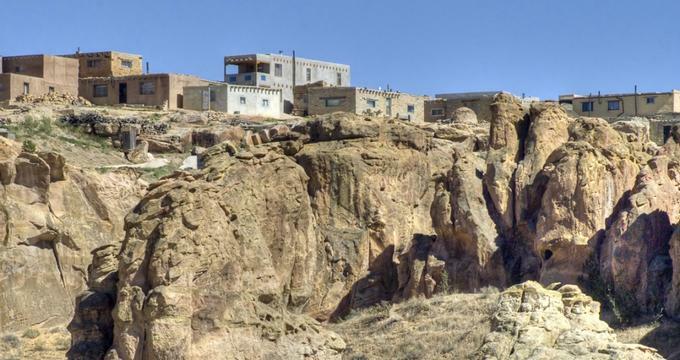 History: Acoma was originally the home of the Anaasazi people, thousands of years ago. Present day Acoma residents are descendents of these tribes. The Pueblo of Acoma was founded in the 13th century, making it the oldest continually inhabited village in North America. The isoloated mesa on which the village resides, and the Acoma’s avoidance of conflict with neighboring tribes, helped shelter and protect the community for over 1,000 years. The Acoma’s first contact with Europeans is believed to have occurred in the mid 1500’s. An account from as early as 1540 describes the Acoma village as “very strong” because it was built on a rock, out of reach, and accessible by only one narrow stairway. A Spanish-led massacre occurred at the village in 1599. Over 800 villagers were killed, and all men and women between the ages of 12 and 25 were taken and placed in to slavery for 20 years. By 1641 the mission was built, and the village had been placed under Spanish rule. A Pueblo Revolt took place in 1680 at which point many of the Acoma departed the Pueblo to establish Laguna Peublo nearby. Today, close to 300 structures remain atop the mesa, with roughly 30 permanent residents, most of whom are spiritual leaders. Tribal members from the surrounding area visit the Pueblo for spiritual ceremonies and traditional cultural events. Over 55,000 tourists visit annually, and may tour the Pueblo with a Native guide. Ongoing Programs and Education: Tours of the museum are available daily. 90-minute tours of the Pueblo depart from the Cultural Center. The walking tours cover rough terrain, and guests are advised to wear comfortable shoes as well as modest, weather-appropriate clothing. Because the Pueblo and mission are holy sites and host to several sacred ceremonies, guest should be advised that all cameras require permits, and cameras are not allowed at all on feast days. Past and Future Exhibits: Exhibits at the museum rotate every few month. Past exhibitions have included displays of Acoma pottery, historic photographs of the Acoma Pueblo, as well as historic lithographs, maps and documents related to the American Southwest and New Mexico’s Native Americans. Language of Honor was a 2015 exhibit in honor of the Native American World War II code talker Paul Histia Sr., who was awarded the Congressional Gold Medal in 2013. To Feel the Earth was a 2015 exhibit on Native American Moccasins, and the art of moccasin making among Southwest Native Tribes.